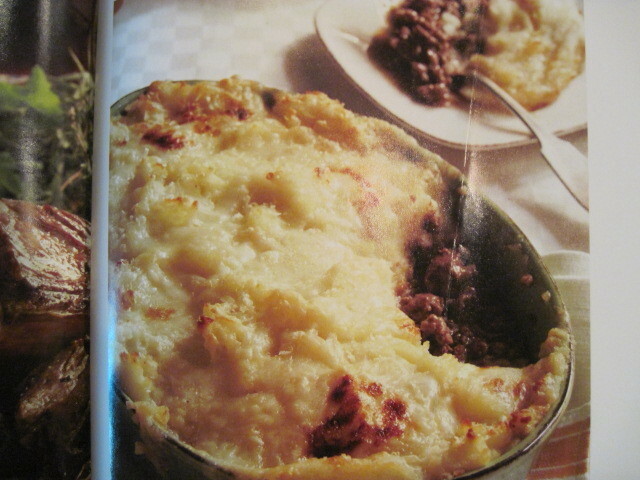 Just the picture alone in Dorie’s cookbook made me want to make this recipe for Hachis Parmentier (Shepherd’s Pie) on page 257 in “Around My French Table”. However, me being me and if you know me, you’ll know I’m not all that good at following directions or reading instructions. Per usual, I didn’t read through the recipe first before assembling my ingredients. Needless to say, I was a wee bit surprised to find out that this recipe (although easy enough to prepare) was going to take me a little while longer to make than I had originally intended. No worries however, it was a Sunday and I was prepared to spend the day in my kitchen while the rest of my family (men) were eagerly plopped in front of the television set watching numerous football games throughout the afternoon. 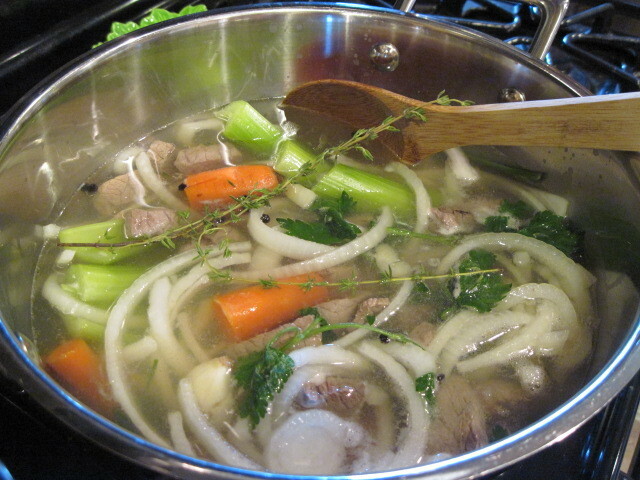 Finally, after having actually read the instructions and before the official “turning on of the stove”, I realized that I would be making a beef broth of sorts by adding the cut up beef strips, veggies and herbs to a stock pot of water and then simmering the ingredients for at least a few hours. 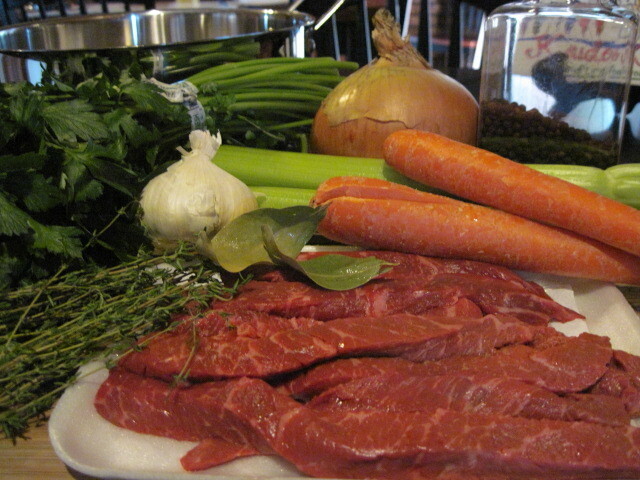 From there you strain the broth, save the meat and discard the veggies and herbs. 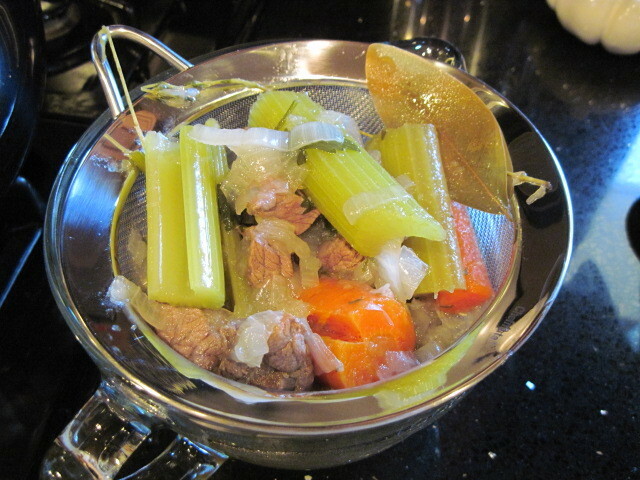 Unless of course you like to add the mushy, overly cooked and flavorless veggies to the actual meat layer of the Hachis Parmentier. I opted just to save the meat and discard the veggies. 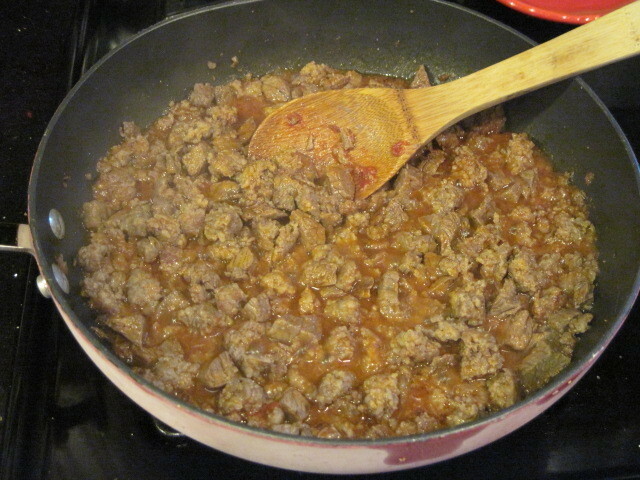 Browned pork sausage, tomato paste, the cooked beef and your newly made beef broth can now be simmered on the stove until the broth has reduced and intensified. 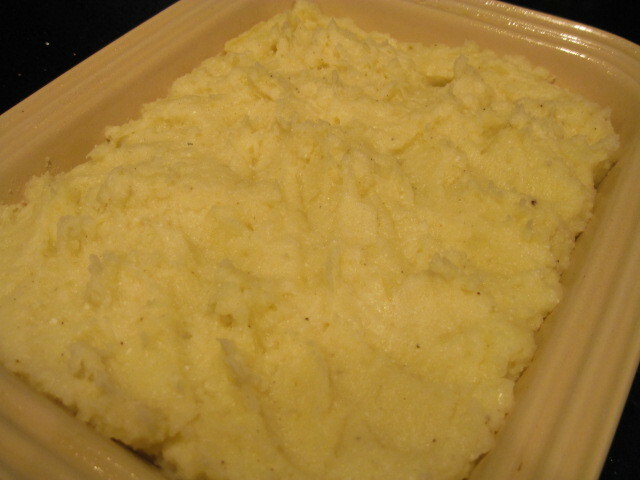 This mixture can be made ahead and tucked away in the fridge until you’re ready to top it with mashed potatoes and cheese. Lots and lots of cheese! 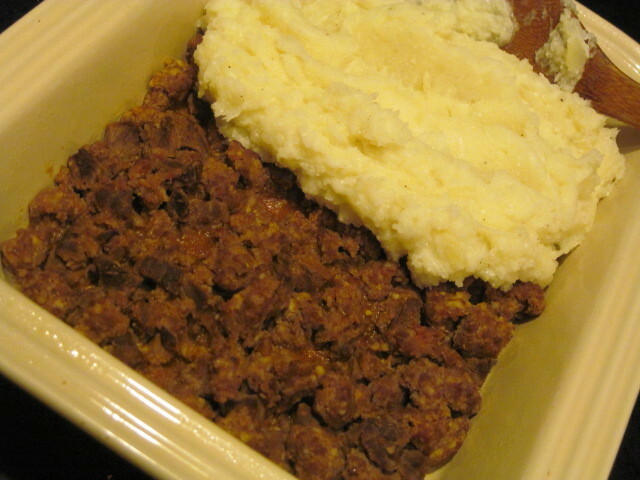 This recipe got a unanimous thumbs up from my family of men. 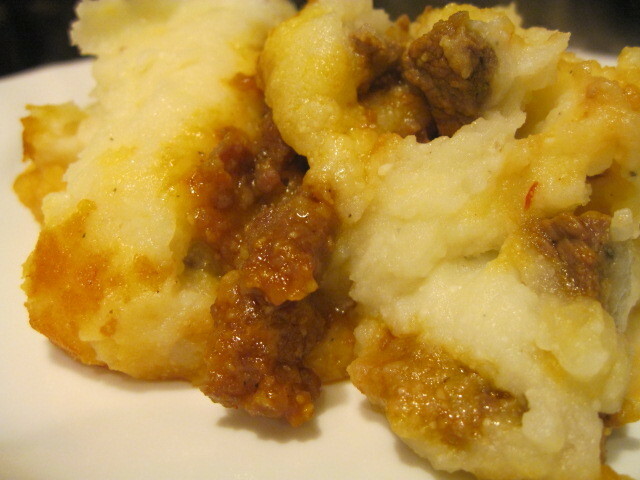 What can be better than meat and potatoes? And the fact that mom didn’t even added extra veggies…Touchdown mom!!! Woo Hoo! Incidentally, I’m doing a giveaway, here on my blog of “Around My French Table” and I also tell of meeting Dorie at a recent book signing. Check it out and I hope you’ll enter to win Dorie’s fabulous cookbook if you don’t already own it! 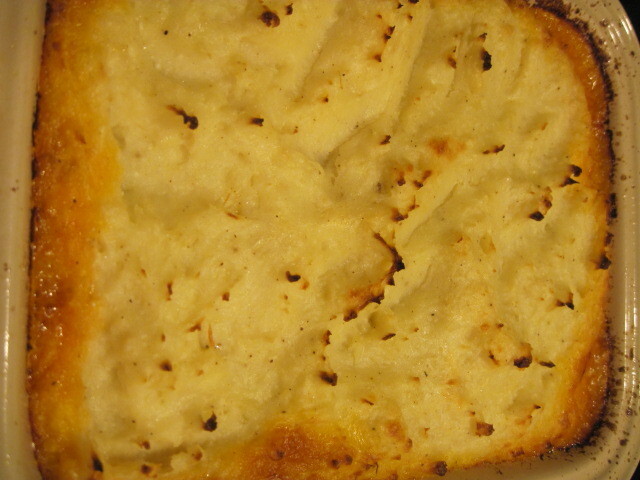 Anyway, next weeks post will be Marie-Hélene’s Apple Cake (page 432) and let me tell you, this cake is NOT TO BE MISSED! Can’t wait to post it for you. Thanks for stopping by my kitchen. I hope you come again! Yum!! I made the full-blown version, too, and it was great. I want to try the quick version on a weeknight, too, to compare the two, and maybe to have another amazing, quick meal in my repertoire. May I have a little bite, please? Great Sunday supper fare. I loved it, too! Yours looks great! 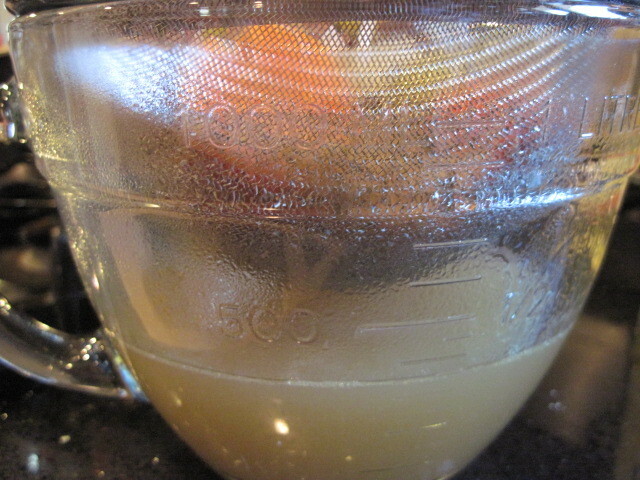 Yours looks so delicious it makes me wish I had taken the long route and made my own stock! If you do end up making it on a week night I took the short cut and it took me about 1 hr 15 min from start to finish, which is totally doable! Looks like yours turned out well. I probably wouldn't make it again unless I had some leftover roast and I'd leave out the sausage. 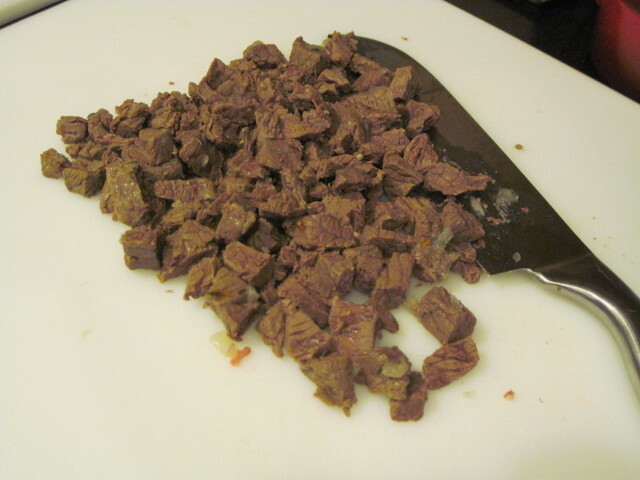 I also wouldn't be against just using ground beef. Your photos are great. Looking forward to your next post from the kitchen! Oh.My.Gawd! That looks gewd!!! I need that book! LOL! This was good wasn't it. 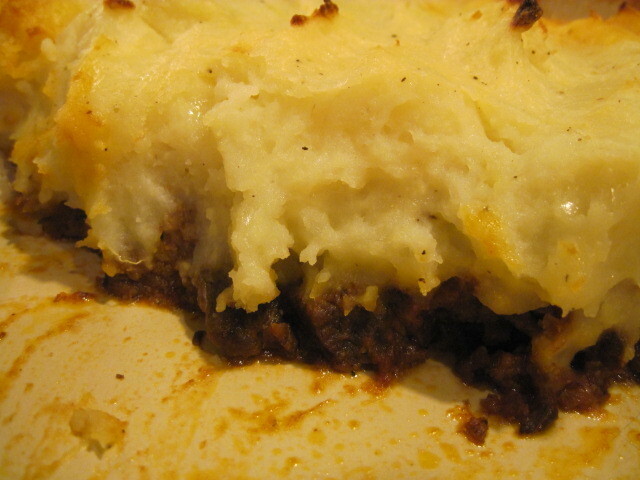 Nothing better than Shepherd's Pie, no matter which culture.